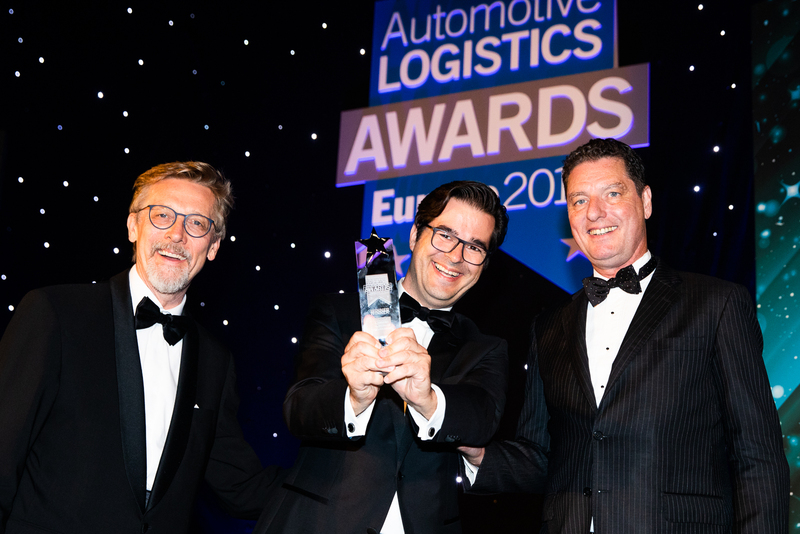 Neovia Logistics, a global supplier of logistics services, has won an award from Automotive Logistics for the invention and design of the Information Console, a touchscreen system used to share performance data at warehouses across the company. The award, in the Service and Performance in Aftermarket category, was presented to Neovia at a ceremony in Bonn, Germany on June 12. The Information Console, also known as the iCON, was invented by a team of Neovia employees to support the real-time sharing and analysis of operational data and key performance indicators at Neovia’s warehouses. Where implemented, the iCON provides a dynamic interface for managers and employees to view, analyze and discuss data and eliminates the use of whiteboard- and paper-based data sharing. The iCON is currently being used in nearly 30 Neovia facilities worldwide. Photo: Pictured accepting the award is (center) Sascha Tilli, Vice President, EAME Sales.